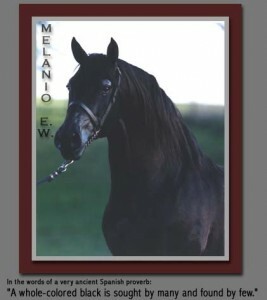 Melanio E.W., 1995 Black Andalusian Stallion, Homozygous for black pigment. Sire: Genio III, one of the most notable black Andalusian stallions to be imported from Spain. Dam: Electra TG, multi-Champion & Reserve Halter mare. MELANIO E.W., is a magnificent, 12-yr old, pure-black Andalusian stallion. Currently there are only 10,000 Andalusians in the United States, which includes horses with pure Spanish, pure Portuguese and pure Spanish / Portuguese bloodlines. Less than 5% of these are black, making Melanio E.W. an extremely rare example of this desirable breed. Melanio is a Halter champion and was successfully shown in various English riding divisions. He was awarded a Best-movement medal. Mel is an excellent cross for Dressage prospects. Many of his foals are available for viewing. If you are interested, please call or email the owner directly, or contact us with any questions.